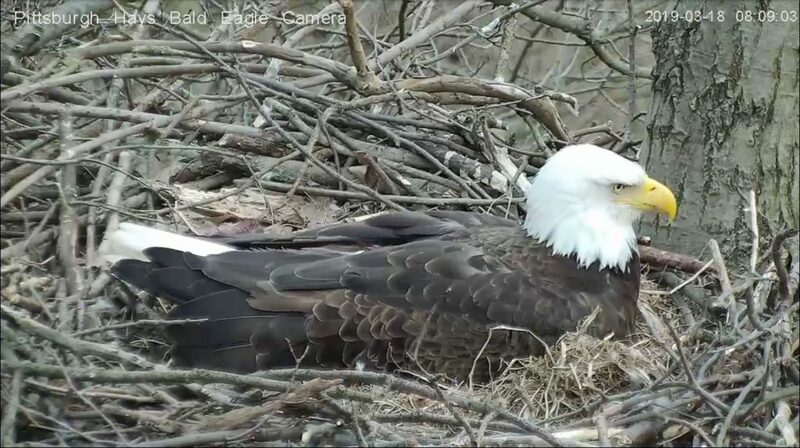 Today is the 35th day since the first egg was laid at the Hays bald eagle nest in 2019. Bald eagle eggs — on average — hatch 35 days after they were laid, so the first egg may hatch today. Or maybe not. Hatching time varies for bald eagles from 34 to 41 days. Just like baby due dates, the hatch date is rarely spot on. However, if you haven’t been watching the eaglecam now’s a good time to start. Watch the Hays bald eagle nest at Audubon Society of Western PA’s Hays Nest Camera. Join the conversation on YouTube or Facebook. I stopped by North Park Sunday afternoon to see the Eagles there. So far they seem to be doing well. I got to see the Male bring something to the nest. Duck? Rabbit? Not sure what he brought but they had a nice lunch together at the nest. Check out the Hays nest on 3-23-19 at 20:24:47, I think I see a chick. Earlier that day, I thought I saw chick around 4:30p.m. when both adults were on the nest. Since the Hays site doesn’t have chat, I can’t confirm. There is a chick! If you scroll back in the Hays live feed to about 8:35 this morning (time stamp at upper right) you’ll see a second parent arriving with breakfast and and a lovely little family scene.